See the college’s campus, read student profiles, get information about classes, see our restaurant menus, or find answers to FAQs. 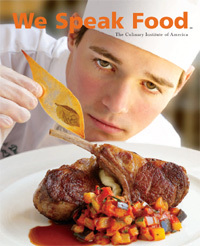 When we speak food, the world listens. 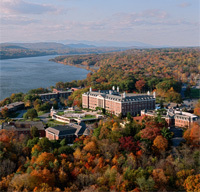 For more than half a century, The Culinary Institute of America has been setting the standard for excellence. Our faculty and facilities are outstanding, and our academic programs foster the ability to think creatively, solve problems, and understand what it takes to be a leader. 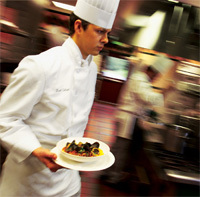 At The Culinary, you'll develop a comprehensive understanding of the culinary and baking and pastry arts. Start with the basics and, as you work your way through your courses, on-campus restaurant experiences, and externship, you'll master methods, menus, management, and more. At the CIA, we do everything we can to make your experience the best it can be. The kitchens are extraordinary; the restaurants are magnificent; the food you eat is better than great; and if you want to play tennis, go swimming, or otherwise kick back, it's all there waiting for you. A typical campus kitchen, filled with the finest equipment and everything that a cook could possibly need, costs about $330,000 to set up. Come see for yourself! In the baking and pastry arts degree programs, you'll prepare, serve, and market café cuisine, confections, and fresh baked goods in the casual atmosphere of the college's Apple Pie Bakery Café. Perhaps the finest culinary library in the world, with more than 74,000 volumes, 280 periodical titles, and 3,500 instructional videos and DVDs. Here, too, you'll find the student computer center and video center, as well as the 150-seat Danny Kaye Theatre, where celebrity chefs do demonstrations. A separate facility just for the baking and pastry arts, with classrooms and bakeshops. This facility houses lecture rooms, a teaching kitchen, and a computer laboratory where you'll be introduced to computer-aided nutrition analyses and the fundamentals of healthy menu and recipe development.